Today is such a significant day – not for food, but for life. This day 10 years ago was one of the saddest days I can remember, and what followed in my life a few days later changed my life forever. I remember getting into my car a little after 6am PST to drive to the gym before heading to work, and they were talking about how an airplane just hit the World Trade Towers. I was shocked, and immediately called my husband to turn on TV. Both of us very naively just assumed it was an accident – but then not too long afterwards, it happened again. I knew then it was not an accident. At this point I was at the gym watching for myself on the television screens. I was in awe, I loved those buildings, I had visited the top deck many times, and it was one of my favorite places to visit in NYC. I kept thinking about the people inside, and how they were all going to get out. I thought about the people I knew that worked around that area, hoping they were safe. When the towers came down, it just about killed me. What killed me more though was how little people understood out in Seattle the true magnitude of what had happened. Most of the people I worked with had never visited these buildings. I barely made it through the day, it was all I could think about – and that lasted all week. I walked around in a haze, my heart going out to all the people who lost someone, and to the people of NYC whose city was invaded. Saturday of that week, I learned that I was pregnant with my first daughter. Unfortunately I wasn’t even happy about it at the time, I was just too consumed with what had happened that week. Eventually my mind shifted to our new baby, and away from the World Trade Towers, but it took a while. When she was born, it was love at first sight – and to this day, I am reminded of the wonderful gift I received that week, when so many people were suffering. Position a rack in middle of oven and preheat to 400°. Whisk sugar and cornstarch in a large bowl. Add strawberries to bowl and toss to coat. Transfer berry mixture to a 2-quart baking dish about 2″ deep. Set aside to macerate while making dough. Bake until fruit is bubbling and biscuits are just cooked through and golden all over, about 35 minutes. Let cool at least 30 minutes; serve with vanilla ice cream. DO AHEAD: Cobbler can be made up to 3 hours ahead. Rewarm at 350° if desired. 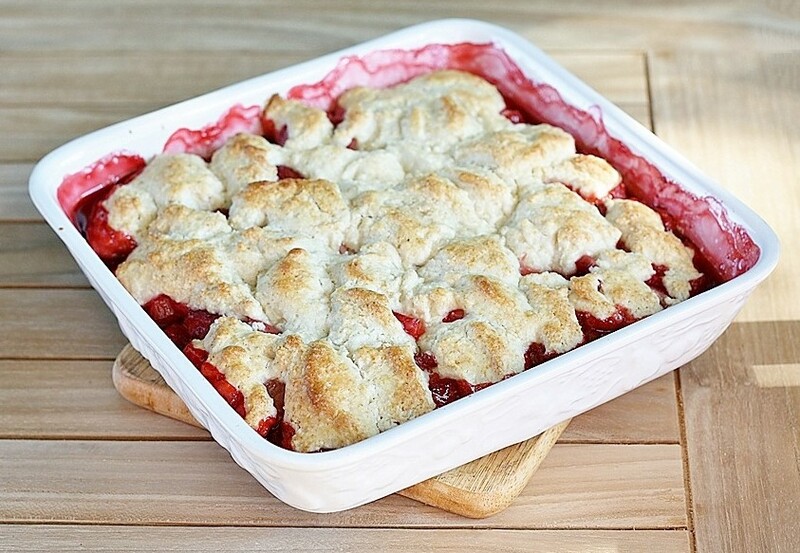 I’ve never made a strawberry cobbler, but I have always wanted to. You (and your daughter) have now convinced me that it would be worth it. And what a great gift to receive that week…the gift of life and love in the wake of such tragedy. Oh what a touching story! How grateful we ALL are to have little H. with us! Such a sweetheart. You deserve the best! And this cobbler looks to die for! Yum. So touching and well-said – thank you. And seriously…gotta try this before summer’s “too” over! Thanks very much, I hope you liked it as much as we did! My story is so similar to yours I was pregnant at that time. Was too tried to pay attention around in NYC .But I was really worried for my dear ones who used to work there.I love your recipe ,going to taste just came out of the oven,Thank you ,for sharing this with every one.